Bes Hannah, Plateau’s miracle baby came at 10:15 on a Monday morning of 8th May weighing 1.8kg. Though two weeks earlier than her expected due date, Hannah arrived through cesarean section, healthy but low weight and has had to undergo intravenous fluid for the first 24 hours while her 63-year-old mother’s breast milk was monitored to ensure it is OK.
Bes Hanny, as her mother now calls her, still looks fragile, but she is indeed the apple of every eye that visits the Gynaeville Specialist Hospital along Old Airport Road in Jos. 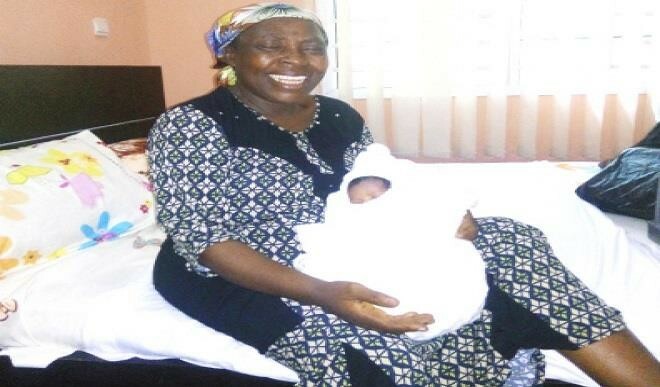 She has continued to attract numerous well-wishers, all eager to get a glimpse of a child whose arrival caused a retired civil servant to shed tears of joy. Her mother, Margaret Davou, who turned 63 on the 25th of February cannot stop laughing even as she struggles to breastfeed her baby. Jos South local government area of Plateau State, has worked as an administrative staff with the Nigeria Television Authority (NTA) in Kano, Makurdi and eventually retired in 2012, two years after she was posted to the NTA Jos Network Centre. Before her delivery on Monday, Margaret had been wary about talking to the press. However, a day after her baby arrived, she had been all smiles, thanking God and became more accommodating. Her husband, 67-year-old Francis Davou had also retired from the Nigerian Air Force in 2008 and says his joy is tenfold that of his wife. “It is because I am a man and so I have to control my emotions, but my joy is more than her own,” he said. Despite their age, the Davous never gave up on their dream to have a child and when a relative of theirs who is a nurse told them about a new fertility centre established in Jos, the coupled prayed and took a chance. “We put our money together. We are both retired so we don’t have much but the doctors helped us. We came to the hospital with my husband and they gave me some treatment, and thank God it worked,” said Margaret. When asked if she ever attempted to go spiritual in the past, her denial was firm. “My husband is a pastor; we have always depended on God. There are some people that have been saying I went to one place in Lagos to conceive but I don’t mind because I know I only depended on God and they will hear the testimony,” she said two days before she delivered. But in their 60s, many have questioned the rationale behind having a child at so late an age even with the United Nations Development Programme (UNDP), report on Nigeria’s life expectancy rate put at 53.1 as at 2015. But the couple is not bothered with what people think. “It is only God that knows who will die, when and where,” said Francis. Dr. Kenneth Egwuda, IVF specialist and CEO of Gynaeville said Margaret had undergone hormone replacement therapy to enable her uterus conceive. Through in vitro fertilization (IVF), Margaret’s fourth attempt and first in the hands of the Gynaeville staff became successful. With 12 years of experience in the field of assisted reproductive health, Dr. Kenneth had pioneered IVF in Plateau, Kano and is about to pioneer a centre in Niger State. Therefore, from the beginning, the Davous knew they were in good hands and after proper evaluation, the doctors realised Margaret was in good health, aged but with no metabolic illnesses or other prominent ageing disease apart from hypertension. “I have done a lot of IVFs, but this is a unique one because the age of the woman makes it so. She appears to be the oldest in Africa to have conceived by this means,” said Dr. Kenneth. Margaret can’t wait to take her miracle baby home as soon as the paediatrician certifies her OK to leave. “The mother is fine now,” said Dr. Kenneth. “If not for anything, the mother would have been allowed to go home but the baby is a little bit fragile and so the paediatrician has to be satisfied before we can discharge them,” he said. But the joy of having a child is not only an accomplishment for the Davous alone, it has given hope to women above 50 in Africa who intend to have children that indeed, it is not too late.